Rinse and slice the squash into rounds discarding the ends. In a bowl, toss the squash rounds with olive oil, salt and pepper until they are completely coated. Prepare your griddle or skillet on medium-high heat with a light coating of oil on the bottom. On a plate, spread out the almond meal. Take each oily squash round and press into the almond meal on both sides. This makes them "breaded". Place each "breaded" round into the greased griddle or skillet. Let them brown on one side without handling them-- the more they are handled, the more likely the breading will become un-stuck! Once brown on the first side, carefully flip to the other side. Meanwhile, finely chop the parsley. 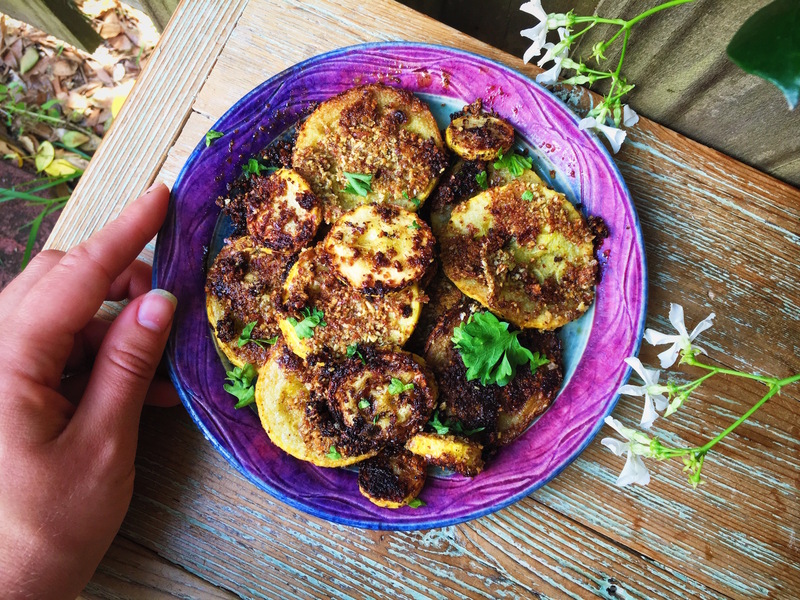 When your breaded squash is finished, sprinkle with parsley and enjoy!